I was thinking yesterday that it would be nice to offer you a free little stitchery to celebrate the arrival of 2017. There was a time when I'd stitch a dated design and piece it in fabric to make covers of each new year's diary, but as I don't bother with one of those anymore (well I do, but I forget to use it more often than not because my computer tells me what I should be doing on certain days at certain times) I took a different path for my sweet little "2017" stitchery. The last couple of months, since I made the somewhat forced, and somewhat chosen decision to 'slow down' my life, I've returned to my old habit of reading novels. I used to read all the time, dozens of wonderful books every year. As a homeschool mum each day would hold two hours of reading classics to my children - even into their late teens. These were the most enjoyable hours, something we all looked forward to. I'd brew a pot of tea, set out cups or mugs, spread a plate with freshly baked biscuits, cake or slice, and we'd settle down for a reading adventure that took us away to another time, another era, with characters we never forgot. But I also read for my own pleasure, and that's something which became less and less of a habit after the children left home and stitchery design took over my time. Fast forward to the past couple of months and I have re-acquainted myself with the local library for some modern fiction, as well as dusted off my own personal library of age-old classics. 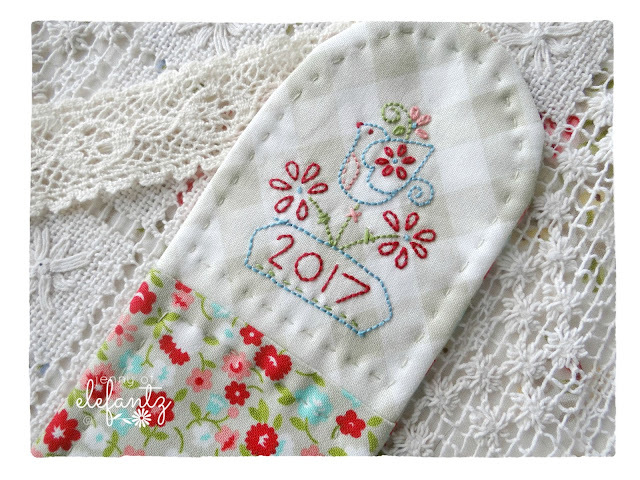 So this little "2017" stitchery has become my new bookmark, one which I intend giving a lot of employment in 2017. Would you like to stitch "2017" too? It's a free pattern download here in my shop and will be available for a whole year. Just out of curiosity, what will you display this little design on? Mr E is having a holiday break for the next 3 weeks, enjoying home time with me before taking up his new teaching position later in January. For our wedding anniversary he bought me a new coffee machine which I have to tell you is *amazing* and the freshly brewed cappuccinos are the very best. Our old Gaggia machine died after four hard-working years of making lattes, cappuccinos and long blacks, but as we truly do enjoy the brewing of a good coffee bean we decided the purchase of another machine was wise. Fortunately for us there was a big Boxing Day sale on at Joyce Mayne and the De Longhi machine we wanted was almost 50% off so that tipped the 'will we/won't we' decision in our favour rather quickly. Good coffee, fresh baked delights from my oven, and time with each other. That's the important stuff taken care of these holidays. One other bit of news. We've prayed, talked, considered all options, and finally decided we shall not be moving house after all. We shall continue to rent this home for another year and perhaps, just perhaps, that might give us the opportunity to save enough for a home deposit of our own by this time next year. You never know. Have a lovely New Year, won't you?! 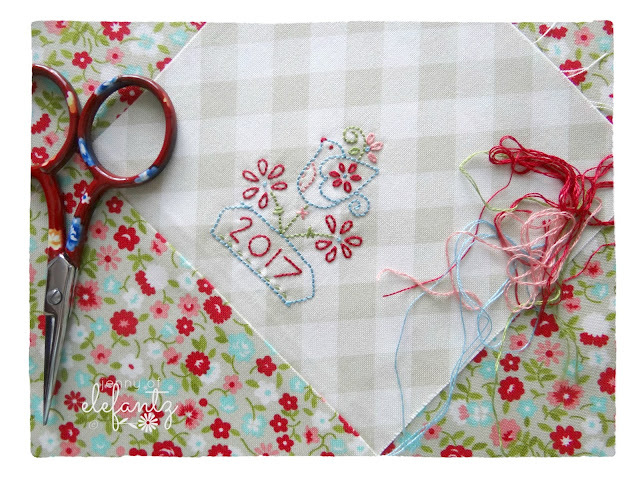 Thank you so much for the 2017 stitchery. I feel that I HAVE to make it into a bookmark also as I love yours and I am doing the same as you, slowing down a bit and trying to read some more. So with the addition of a new bookmark, that will give me a lot of encouragement. So thank you so much and Happy 2017. And you will not regret waiting to move until you have more money. That is always the smartest thing to do. And the scones do look yummy!!! Yes, Digby, he's teaching just 10 minutes down the road. Bonus! Thanks Jenny. How are you feeling. Hope you have a great New Year. Your decision not to move is probably the less stressful path and shall give you more time. Enjoy your coffee, books, baking, and your beautiful family. Angel hugs. Thank you for sharing such a beautiful gift. Thank you for the adorable design. I may enlarge it a bit and make a tree ornament for next Christmas. I have fallen behind on reading "The Cat Who" series by Lilian Braun since before Thanksgiving. I hope to jump back in mid January. God will guide you when the time is right to move. Have a wonderful 2017! 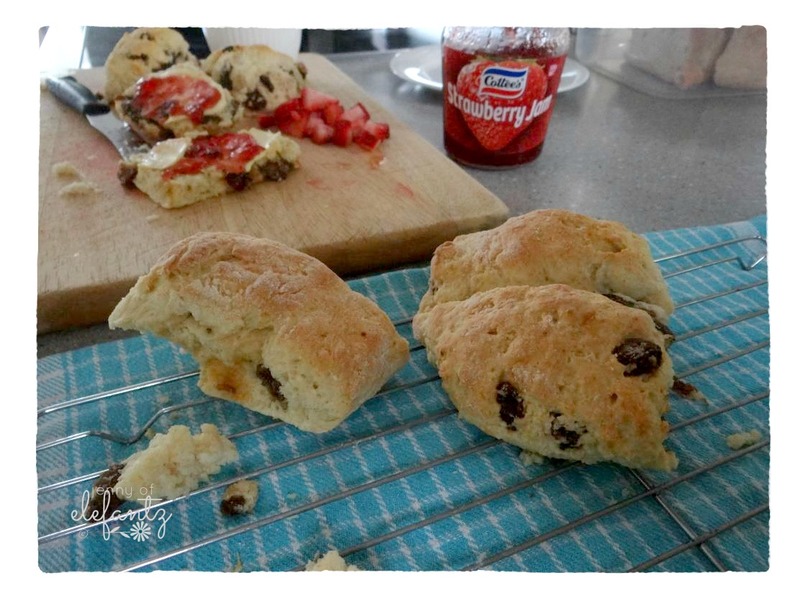 The scones look absolutely delicious. If I were your neighbor, I would pay you to bake for me. =) I try, but I really don't like being in the kitchen any more. I'm so excited you and Mr. E have 3 weeks to play! I pray you will be able to save enough for the down payment on that house you'd like - whatever house it turns out to be. At least you are staying close to Blossom's family! You don't need to respond - just know I love you and pray for you daily. Thank you for the free stitchery. 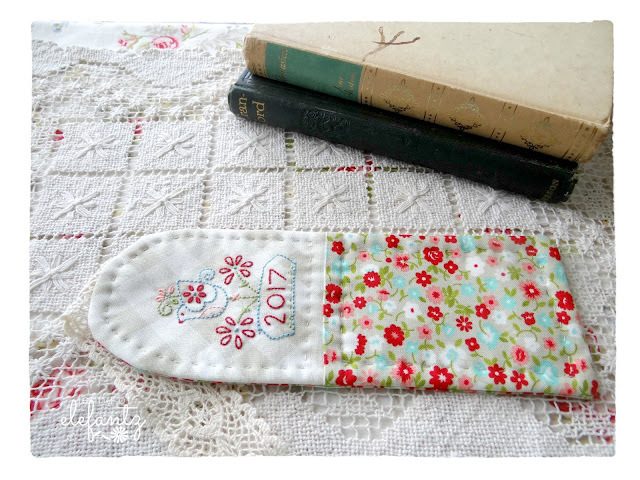 I like the idea of a bookmark but also for dish/tea towels. From experience, I know the advantages of living in a rented place and also owning a home. Take your time. You can always look at places that come up for sale even if you are not yet in the market. My hubby and I used to spend Sunday afternoons going to open houses for cheap entertainment and just to see what these houses were like with no pressure to decide if it was the one we wanted. It also helped us come up with a list of must haves, wants/desires, and also what we didn't want or care about. When I was homeschooling reading time was our favorite time of the day also. It always brought memories back of my mother reading novels to my brother next to me in age while we ate our lunch. She had to do it though because we would pick at each other during the entire meal until she came up with her solution. After taking us back to school she would then go home and eat her own lunch. I am so glad that you and Mr E. are able to have this time together before he starts in at his "new" venture. I have always been a reader but in the past years the only time I have carved out for myself is in bed at night before I go to sleep. The bookmark is so cute. It put into my mind of making it up in a bookmark also and giving it to our 10yr old granddaughter. It would be fun to make her up a new one every year to mark the time. Thank you for your generosity Jenny. You are such a giving person! I wish you a Happy New Year! God bless You! Your blog is definitely one of my favorites. I look forward to each entry and whatever you share. 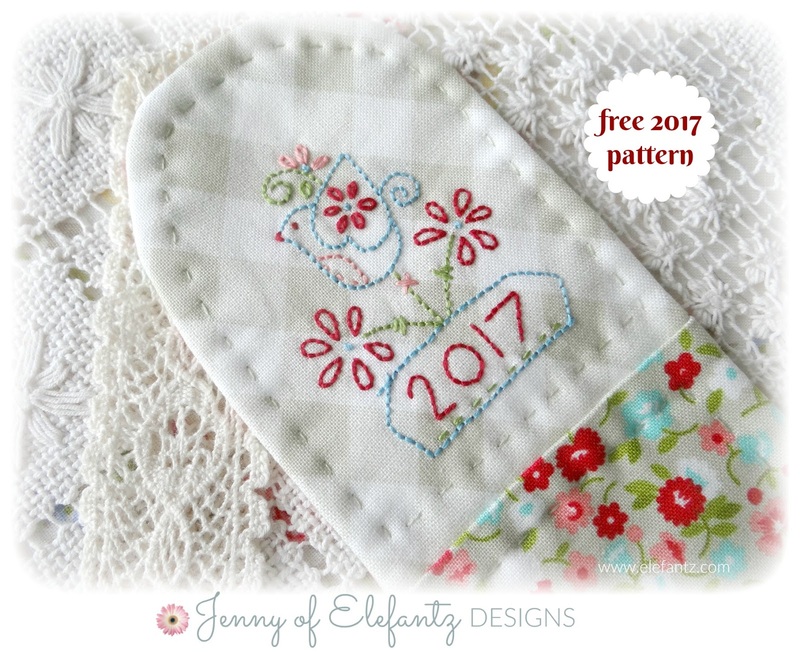 Your designs are adorable and the 2017 embroidery design is lovely. I plan to use it on some postcards to be sent to friends and family since I didn't get my Christmas cards out this year. I'm sure everyone will enjoy this design. I can't wait to see what the New Year will bring. Your designs are always the sweetest. Thank you for sharing your God-given talents with us. I love to read, even though these days it's usually the audio versions in the car because I don’t like the radio. It's amazing what I come up with for a bookmark skin I think I'm going to use your design for an official bookmark. Wishing you and yours a happy, blessed new year. I wish you ad yours a Happy and healthy New Year!! Thanks Jenny for your generosity. You are such a blessing! Sorry to hear about your health challenges-I too am experiencing a few also-but it's good that you are taking such a positive view on things and using this to make positive changes in your life. I'm glad that God has blessed you with your gift of design as I'm sure it brings you joy and satisfaction in the midst of the challenges. I know that all of us who follow you are so blessed to be recipients of your wonderful talent/gift. May God's blessings be with you and Mr E in 2017; and may He guide you to your own home in His perfect time; and bless you richly where you are now. Thank you for the lovely stitchery design. And I wish you a Happy New Years as well... 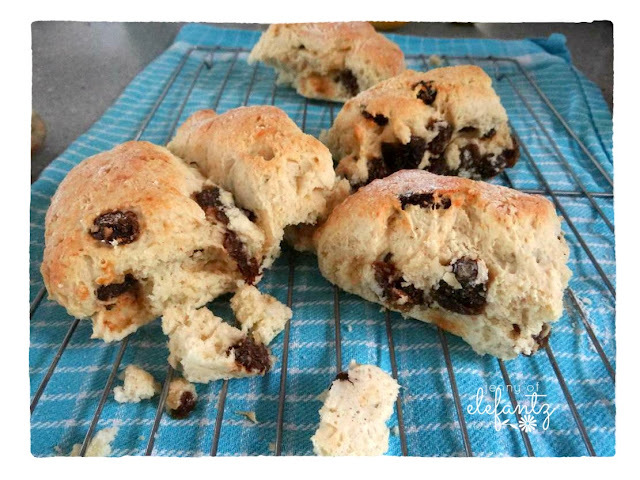 Your scones look amazing.... I'm so glad Mr. will be teaching nearby. I do so enjoy your blog posts. Thank you for sharing your talents and wisdom with us. 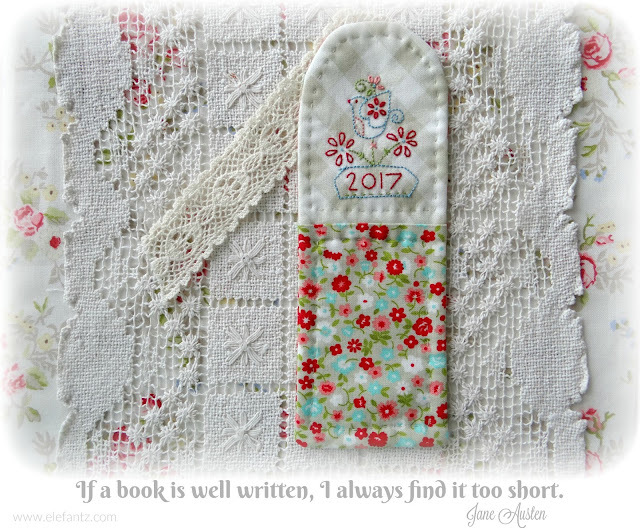 I will be using the 2017 stitchery as you are....for a bookmark. Best wishes to you for a healthy 2017! PS Your grandchildren are so precious...I have one granddaughter as well and she is such a special gift to us! It has been wonderful reading about the more frequent opportunities you are now having to see them! Happy New Year Jenny and to all the family. Hope this year is a happy & healthy one for you all. Hobbies can take over can't they. I fond that it happens with knitting for me. I stay up until all hours to finish things. Same goes for reading, I just can't put books down so I'm up until all hours. I now tend to save it for holidays or travelling. I'm still a book person though, can't use tablets or anything else to read. Love the feel of a book and using bookmarks too. 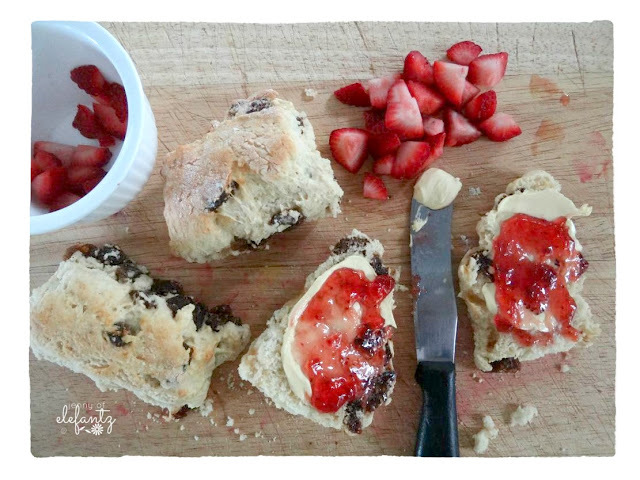 Those scones look fabulous and like you I had a Gaggia for years. I don't drink tea so my coffee maker gets a real hammering. 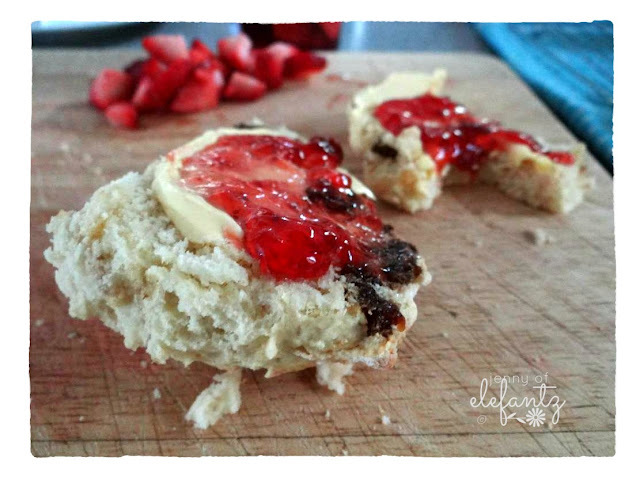 Not moving house makes sense and gives you extra time for the things you love doing. SO have a great year in 2017. I love what you did, combining stitching and sewing into something useful, quick and easy....and uses up little scraps.....my favorite projects. Thank you and I will certainly use this to make bookmarks, hopefully get back into reading books also.....away from electronics. Love your works and creations, and hopefully 2017 will bring success in all your endeavors. Thank you for all the free embroidery patterns that you've given out to us all. Happy New Year. I've just found your site and hope to get back into embroidery I've done a little this past Christmas on some gifts that I made. I'm going to put all of the patterns into a folder and have handy for when I have a few minutes to spare. 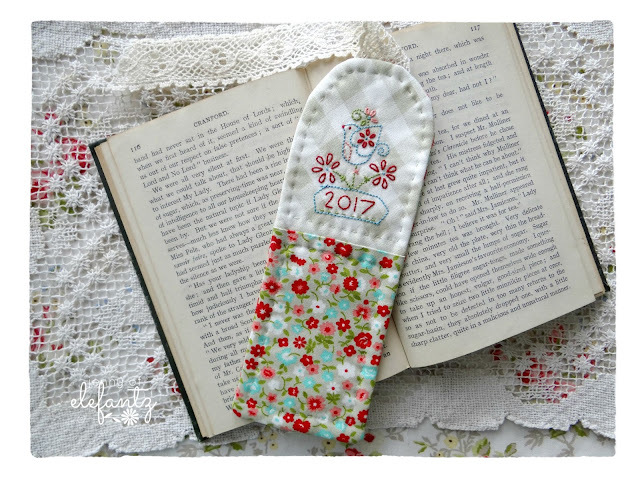 Hi Jenny, I used your sweet little embroidery pattern when making a bookmark for my mum. I changed it just slightly by taking out 2017 and changing it to the word "Mum".